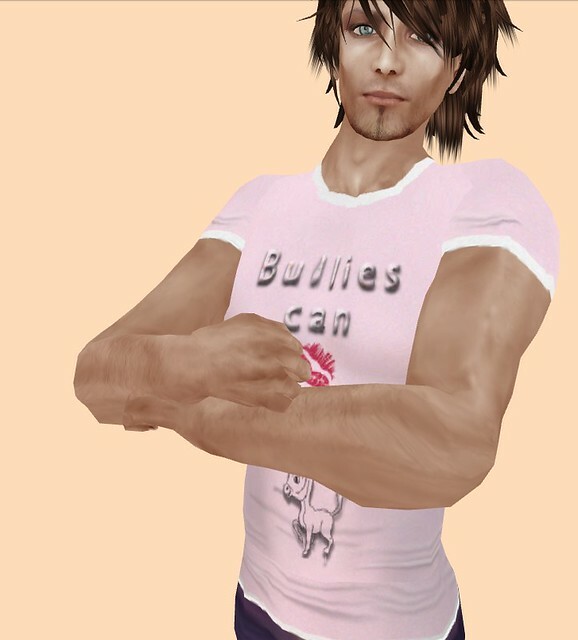 Pink Shirt Day has spread to our little corner of InWorldz, thanks to a post by Mera Kranfel who relayed the information and touching story about a young Canadian boy targeted by bullies on his first day of school, story on Honour's blog. Thanks Mera! To show my appreciation for this great cause, and because I'm a big softie always looking out for the underdog, I'm sporting pink in a big way today. My quest in the search for pink on the grid was further triggered by a Twitter post by Leanna Caerndow who wanted to find "pink clothes IW that aren't either tarty or barbie". In this look, I found a fabulous pink casual flowered sweater at Indie Rose, and paired it with the great sculpted 2-tier skirt from Sassy, leopard print stockings from Random Rosie, and Volo shoes by Coriander. Hair is the lovely Felicity by Ophelia Rose of Wish! Skin is Ethereal by Talia Fournier of Paparazzi, with Everyday Lashes layer by B[u]Y Me! A little fun pose "Kill Bill" by Lydia Cremourne of Posture Perfect. Look out! Hoping this comes across as neither "tarty" nor "barbie". Either way I had fun with it!! Take a stand and join thousands of people across the world on Pink Shirt Day. Even if you don't have anything to wear in your real life wardrobe, there's plenty to be had in the virtual world of your choosing, and often for mere pennies or even free. Talia Fournier of Paparazzi has generously donated a new shirt for both men and women, which can be found for FREE in her shop upstairs on the Equinox Sim (in InWorldz). Love it! Bullies can kiss my little donkey! Cute, yes?! Best part is, it's copy and transferable so you can share it with your friends! Thank you Talia! I have to admit... getting Pinked was more than a bit addictive! I also found a few other looks I hope you'll enjoy. Great styles to keep you in the pink and help show your support for such a noble cause. Here we have fantastic hair by Ophelia Rose of Wish, the Olivia Cropped Sweater and Vintage Striped Sweater by Stellar, Jeans by Stellar and Mwah! and some great new Volo training shoes by Coriander. Share the love... and Get Pinked! Wow! I do admire your sense of fashion, I wish I had just a tiny bit of it. This is definitely neither tarty nor barbie! Also, I need to get those sneakers. Hi Teal! Yes! I just love the look and feel of Indie Rose clothes and so glad she came over to InWorldz to share with us.